Have you recently transitioned to vegan? Or are you thinking about it? The vegan diet is completely plant-based, with no animal products whatsoever. That means no eggs, no milk, no cheese, no fish, and of course, no beef, chicken, or any other animal products. A typical vegan diet includes veggies, fruits, grains, beans, legumes, and soy-based proteins like soy milk and tofu. If you recently started a vegan diet, you might be wondering what exactly you can eat, so we decided to put together a list of 50+ vegan meals for beginners! I’m not completely plant-based, but I’ve never been a huge fan of meat. From since I can remember, I’ve always gone for the tofu option if there is one, and I love experimenting with recipes from cookbooks like Oh She Glows and Vegan for Everybody. Plus, Pinterest is your best friend when it comes to finding delicious recipes. When you can have a hearty black bean burger or even vegan mac n’ cheese, it’s no wonder so many people are transitioning to plant based diets. In the past week alone, I’ve talked to at least 3 people who are eliminating animal products from their diet. Some have gone cold turkey, while others are slowly weaning off meat. Today, there are so many vegan options out there, from vegan hotdogs to vegan cheese, and even vegan mayonnaise, that it makes vegan meals a lot easier and more appetizing! There are even vegan restaurants and cafes that solely sell vegan eats. If you’re looking for a guide to a vegan diet for beginners, take a look at what you can and cannot eat on a vegan diet, and 50+ easy vegan recipes to add to your recipe arsenal. As you can see, there’s still a ton of awesome foods you can eat on a vegan diet. We’ve rounded up some cheap easy vegan meals so you can start the diet off right! 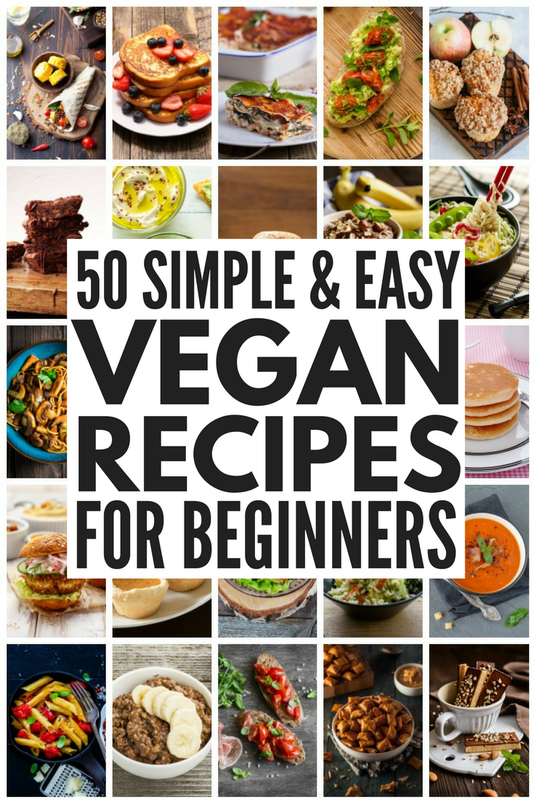 Here are 50+ vegan recipes for beginners! I don’t know about you, but that list sure made me hungry! We hope you love this round-up of cheap easy vegan meals for beginners! If you liked this collection of vegan meals for beginners, please share it on Pinterest! And if you’re looking for more vegan recipes, please follow our Food and Recipes board on Pinterest!